The TAD753GE is a reliable and economical diesel generator engine by Volvo. This diesel generator is built to produce vibration free operation with with low noise level. They are built to offer excellent combustion and low fuel level consumption. This series of diesel generators complies with emission regulations. The DSE7320 is an Auto Mains (Utility) Failure Control Module suitable for a wide variety of single, diesel or gas, gen-set applications. A sophisticated module monitoring an extensive number of engine parameters, the DSE7320 will annunciate warnings, shutdown and engine status information on the back-lit LCD screen, illuminated LED, remote PC, audible alarm and via SMS text alerts. The module includes RS232, RS485 & Ethernet ports as well as dedicated terminals for system expansion. Americas Generators offers a full line of Volvo powered diesel generators with high quality and built-in reliability. Volvo is a world leader in diesel engine technology and fits well in all types of industrial diesel generator applications. The Volvo diesel generator engines are using the latest advances in design by developing high outputs without sacrificing ruggedness or longevity generator life. 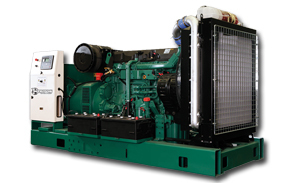 The quality of each diesel generator is unsurpassed, and will last you years to come. For more info about Americas Generators' inventory of generators powered by Volvo, contact one of our associates at (800) 434-0003.